Home song review Luka Chuppi- “Poster Lagwa Do” song Recreated! Luka Chuppi- “Poster Lagwa Do” song Recreated! Remember Akshay Kumar’s film Aflatoon? It has been in the news recently after it was revealed that Kartik Aaryan and Kriti Sanon’s upcoming film Luka Chuppi is set to remake a song from the film titled – Poster Lagwa Do. 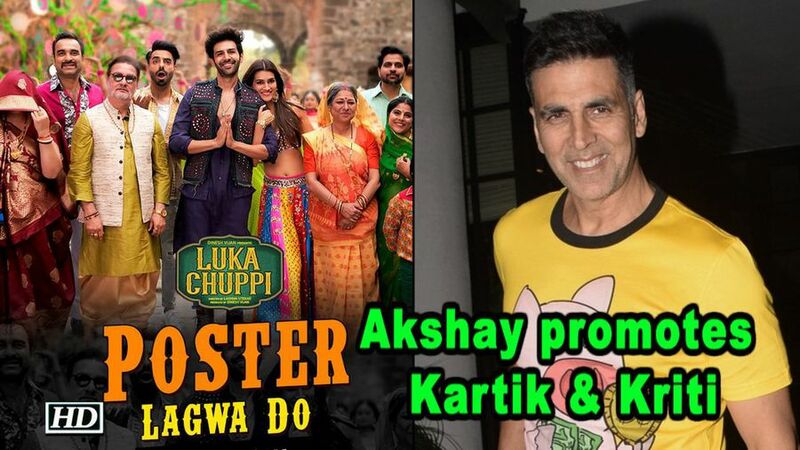 Last evening, in a promotional video for the song, Kartik and Kriti were seen dancing to the hit ‘90s number and guess who made an appearance – none other than Akshay Kumar himself! Well, the song is finally out and we can say one thing for sure, Kartik and Kriti dazzle in this remake of the hit ‘90s track. The song has been sung by Mika Singh and Sunanda Sharma. Kartik and Kriti’s track is as much style as it is comedy and there are moments in the song that’ll make you laugh out loud. The internet recently witnessed and loved the trailer of Luka Chuppi, after the cast and the team revealed it at an event in Mumbai. The trailer revealed how Kriti Sanon and Kartik Aaryan’s characters in the film wanted to try being in a live-in relationship, and do as well but with a major twist. As to what it is, watch the trailer below and find out!